After 33 years as an Orthodox clergyman in three different countries, I would like to make the following observations about missionary work. Before anything else, it must be said that missionary work is never done top-down. In other words, it is not a matter of people sitting in offices poring over maps and sticking pins in them. That would be a great mistake. We are not McDonalds. Missionary work begins at the grassroots with the people who are inspired by God. It is therefore down-up. Some 15-20 years ago I wrote an article on what is vital for missionary work. It was entitled something like ‘The Three Ps’. The Three Ps are People, Premises and Priest – in this and no other order. Let me explain. The first P means that all new missions open because there are people who want them. People does not mean self-servers who want to ‘open a mission’ for their own vainglory. Nor does it mean people who have a consumerist mentality towards the Church: ‘We demand a priest who will do everything we want him to do’. People means Orthodox people who want to pray together in an Orthodox church building, worshipping, praying to and thanking God, receiving the sacraments, of whom at least one can read and sing. Their first task is to contact their bishops and ask for his blessing, then decide whom they wish to dedicate their future church to and next look for suitable premises, preparing for financial sacrifices. The second P means Premises, suitable for Orthodox services. It does not matter too much what they look like on the outside, at least initially, but on the inside they must be capable of transformation so that they will look like and then feel like an Orthodox church. They must be public-access premises with planning permission, located where Orthodox live, in a town or city, not in the middle of nowhere, still less be part of a private house of property. Ideally, they should be neither too small, nor too big, though with room to expand. If they have a kitchen, meeting-room, toilets, parking and you can have processions around them on Great Friday, Easter Night and on the patronal feast, then they must be near ideal. The third and final P is priest. This is the least important issue because if you have people and premises, a priest will appear. However, it is vital that the priest speaks the language of his parishioners – in all senses. This means not only that he speaks and understands at least some of the most common language of his parishioners – which may not be English – but that he understands them and sympathizes with them. 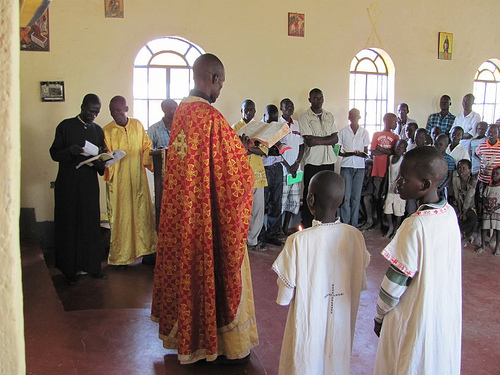 It is ideal when a priest is one of the group of people who has made his way through all the stages of priesthood – reader – subdeacon – deacon – priest – and therefore knows what he is talking about and understands.